Stamp couple using Memories or permanent black ink on white card stock. Color with pencils. Cut out and attach to background paper with foam tape. 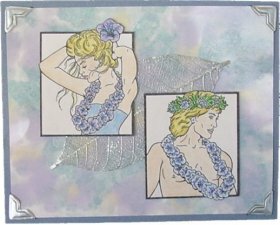 Add silver skeleton leaf and photo corners and layer to blue card. Note: For background, we used a foam wedge sponge and assorted light-colored dye inks. Rub and dab over glossy card stock.